Until three years ago, MichaelKathrein truly believed courtrooms were places where judges listened to the facts carefully and decided cases honestly. Then he got the lesson of his life. A judge in his case could, and did, cheat. Opposing counsels could, and did, cheat. And once they coordinated their cheating, no fact, law or procedure could save him. He was set up to lose. When you think of a “corrupt” judge, you may think of one who trades rulings for cash. As far as we know, that obvious sort of corruption is rare. You must appreciate however, that corruption may take subtle but equally destructive forms. Among other things, a dishonest judge can ignore evidence, twist rules and procedure, obstruct the record, retaliate, manufacture facts or ignore others, allow infirm claims or dismiss valid ones, deny admission of evidence prejudicial to the favored party, suborn perjury, mischaracterize pleadings, engage in ex parte communication and misapply the law. When he or she does these things intentionally, (motivation is a separate issue) he commits a crime. Petty or grand, the acts are still crimes. It takes surprisingly little to “steer” a case. After the American Revolution, our Constitution was conceived and adopted as the mechanical foundation of our government. For ordinary citizens, the independent grand jury was the only tool of salvation from judicial corruption. Without this critical tool of redress, American civil rights exist only at the will of a judge. That tool (unfettered access to a grand jury) has been taken away. Judges simply snatched it from us. They did it by enacting “judicial legislation,” i.e., by “ruling” that private citizens had no right of access to the grand jury. They took the grand jury from us and they gave it to themselves, and they use their "gatekeeping" power to protect themselves (from accountability) all the time. Who decided, “What will be the law?” Judges did. 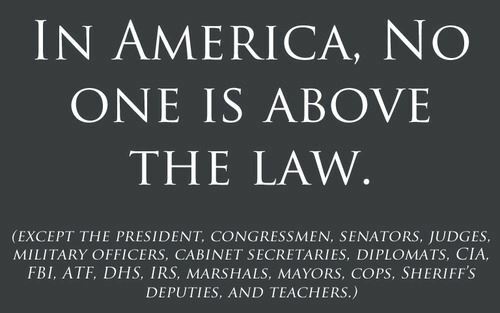 Who is supposed to decide, “What will be the law?” Congress is. Right under Congress's nose, the entire judicial branch of our government placed itself out of reach. They eliminated all means to be held accountable to the public for their actions. Judges are now, above the law. Federal judges and federal prosecutors routinely block the access common citizens are supposed to have to the federal grand jury. There is a logical but not legal, reason for this. If you have ever seen someone hustled through the courthouse cattle chute, you will understand that “equity” and “justice” have little to do with the process. Judges can be determined to make things turn out the way they want them to and naturally, prosecutors are always determined to get convictions. In many ways, equity, justice, facts and law, interfere with the process. Have you ever stopped to consider that public defenders (the poor man’s lawyer) don’t investigate anything? Public defenders do not have police or detective resources at their disposal…only prosecutors do. Your defense will rely almost entirely upon the evidence the prosecutor decides to “share” with your lawyer. If the prosecutor “forgets” or “loses” evidence that would help your case, or decides to ignore an important lead, he will win and you will lose. That is not merely misbehavior, that is criminal behavior. The very last thing a prosecutor (or judge) wants is a properly operating, independent grand jury. The ONLY recourse that remains now, against a corrupt judge, is to respectfully "request" that the judge evaluate himself for honesty. What criminal wouldn’t desire the power to block an investigation of their own crime? It is hard to imagine a more fundamental or structural conflict of interest than that. To protect the sanctity of the judiciary, otherwise honest judges are driven to shield the misdeeds of their crooked brothers at the bar. Perfectly understandable human nature, yes... but when this behavior is at the expense of the public trust, it is utterly unpardonable. The courtroom is no place for situational ethics. A judge who is honest 99% of the time is useless to the people. If this judge is your judge, his 1% of corruption equals your 100% of conviction. Your right to a fair trial does not go away just because nine out of ten people did get one. And your right to challenge a man for criminal behavior should not go away just because that man wears a black robe. Justice cannot tolerate exceptions. Just like a cop, a priest, or a bank teller, if they cross the line once, they have to go. Dishonesty is extremely difficult to detect and prove. External, independent, unbiased inquiry is the only solution. Judges have taken control of the “right” to assert your guaranteed rights, i.e., they are no longer inalienable as guaranteed in the Constitution. You have them only when a judge feels like letting you have them. If he doesn’t, you don’t. There is nothing you can do. Effectively, judges “dispense” our rights at their whim and pleasure with total impunity. Unfortunately, ordinary citizens have no other means to enjoy or enforce their civil rights except through that same court system. What this means is that without a mechanism for remedy, (the court) you have no rights. If a judge refuses to order relief, then you don’t get any. Therefore, citizens have no choice but to (literally) pray to a judge for leave to assert their rights. Where their prayers are denied, their rights are denied. This type of abuse is exactly why our forefathers granted ordinary citizens the right to access the Grand Jury directly. It is a centuries old system of checks and balances imported from England, installed in America to protect ordinary citizens against judicial tyranny. Direct access to a grand jury is the victim’s path (us) around the victimizer’s (bad judges) roadblock. In this Petition you will see a perfect example of justice thwarted by the very people (judges and the U.S. Attorney) who are supposed to ensure that justice is done. Kathreinlseeks to expose and eliminate this unfair Conflict of Interest. Why did the Seventh Circuit try so hard to bury his case? Because to allow a common citizen direct access to the federal grand jury is to expose the judiciary's Achilles heel... accountability to the people. Title 18 U. S. C. § 242 provides that judges are liable for criminal acts committed under “color of law” meaning that judges may be immune from prosecution for civil misbehavior, but they are NOT immune from prosecution for criminal behavior. The only way to make a judge answer for criminal behavior is to bring criminal charges against him. The ultimate irony here is that the only way to bring criminal charges against a bad judge is to ask another judge for permission to pursue the bad judge. As noted above, that will never happen. As long as the subjects of the investigation (judges) are the gatekeepers of the investigation, there will be no investigation. Therefore, judges have rendered Title 18 U. S. C. § 242 unenforceable. IfbKathreinlcannot win this fight to bring evidence of judicial misbehavior directly to a grand jury, then all Americans who are victims of § 242 crimes are denied their civil rights. It will become forever impossible to get a complaint against a judge, past a judge. This is why his complaint matters so much to so many... because you never know if the judge on your case is going to do his job. If he decides to steer the proceedings against you, you will wrongly lose your property, your liberty and perhaps your life. You MUST have a way to protect yourself. Read Kathrein'slBooklet to understand how this barricade affects all of us...in ways you would never suspect. Does an American citizen have a Constitutional right to petition the federal grand jury to investigate crimes committed against him? Does an American citizen have a statutory right to petition the federal grand jury to investigate crimes committed against him? Do members of the executive or judicial branches of government have the authority to block access to the grand jury? View all documents, including the Writ of Certiorari. Brief summary of the case.